urbanfires | Fires & fireplaces for every application. Indoors or out. Flued or flueless. We are a card-carrying outdoor fire enthusiasts. We think they provide a great focus for outdoor entertaining and there is unquestionably a restorative effect to the warmth of the gentle glow of flickering flames. For the garden designer, fires should be a tool for spatial control and structure within a garden. Not only is a fire an attractive focal point to anchor a view, but the placement of a fire element or fire pit will create a distinct zone in front of or around it, identifying this space within the wider garden scheme. We don’t need an excuse to fire up the the firepit on a Friday night and endeavour to entice friends outside to have a glass of wine, sit and stare into the flames and let the stresses of the week melt away. Maybe the most fundamental design choice for the client is which material to use? Masonry, textured render, cast concrete, Corten steel or stone are all commonly used materials for fireplaces or firepits. This masonry fireplace was built by the landscaper and then expertly rendered. 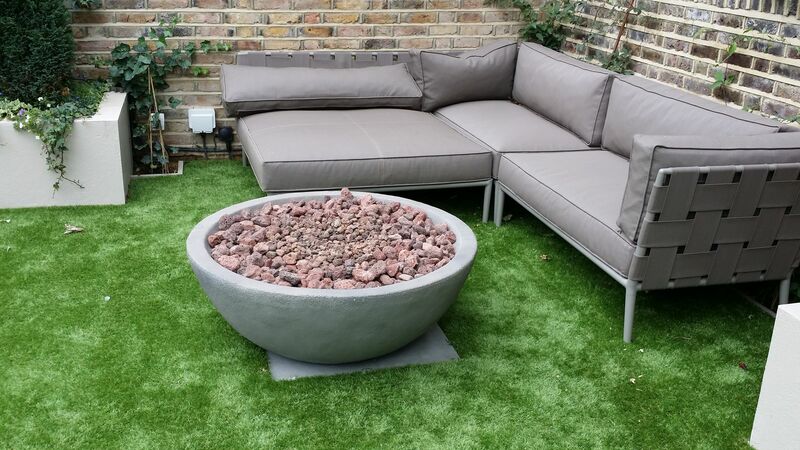 The Corten steel firepit (below) can be made in 1400mm or 1800mm width. Cooking on an outdoor fire is possible when wood-burning – and one can deliver a fantastic flavour profile to even the humblest of foods. Some of our off-the-shelf units are designed primarily around the cooking aspect, with adjustable shelf heights or grilles. An Escea EW5000 (above) will do a pretty decent job on a boneless leg of lamb as well as kebabs. While it can be a bit tricky to control the heat and the cooking portion of the evening seems all too brief in comparison with the preparation time, this sense of inefficiency is more than offset by the social interactions that occur around the fire in the time leading up to meal time. 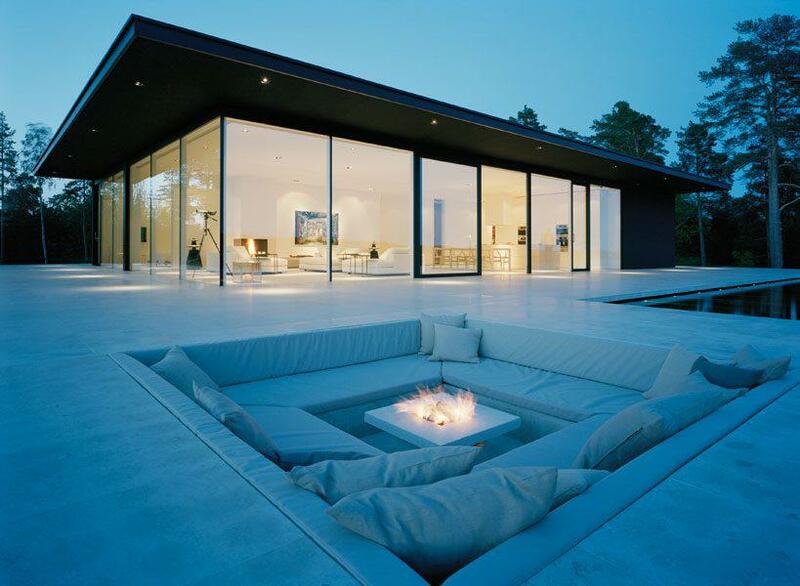 Or, you could be even more adventurous with a designer firepit! 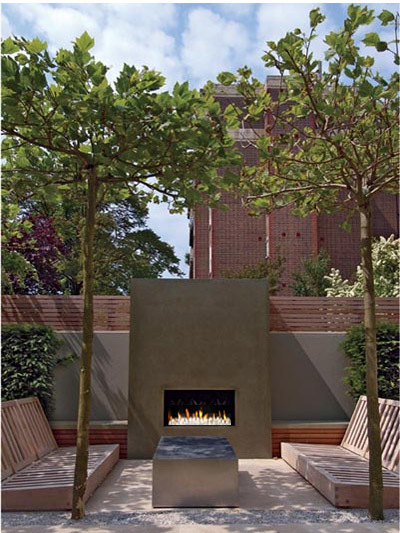 It may be a good idea to check with your landscaper or designer in terms of what planning or building rules might be applicable to the location, when undertaking a major garden project, but generally, the installation of an outside fireplace doesn’t require any permissions in the UK or Ireland. Understandably, there are rules around placement in relation to combustible materials such as yours or your neighbour’s house, shed or fence and smoke annoyance. Gas fireplaces can be considered completely safe and smoke-free. A combination of wooden decks and a woodburning fire might require some creative thought as to how to minimise any risk. (You should also consider things like proximity to your neighbour’s washing line or windows to minimise smoke nuisance). 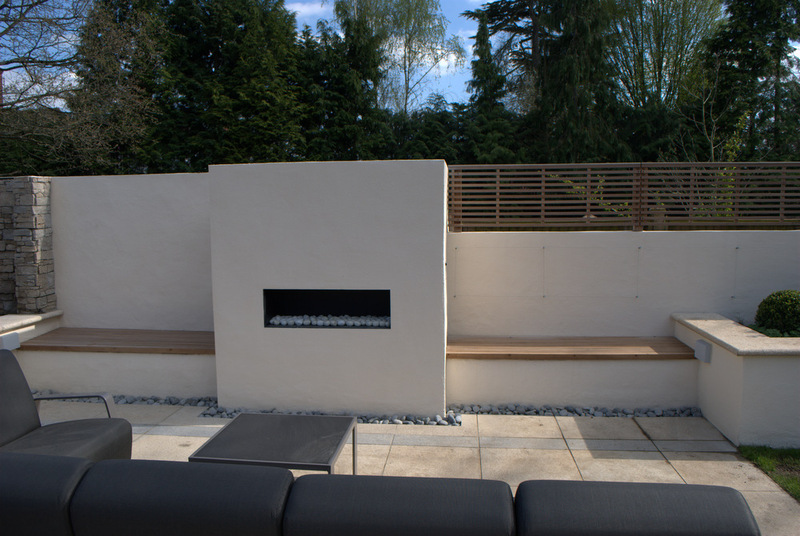 Outdoor gas or bioethanol fires produce no smoke and don’t need a flue, but if you’re after a wood burning fire, there are some considerations that need to be given to the placement of the chimney, not too close to a neighbours windows or you could be in trouble with the local authority. The use of a ready-made steel firebox like the EW5000 can be a good idea, as many of these factors have already been accounted for in the design of the unit. A gas-burning fireplace may not generate quite as much peak heat as a wood-burner, although there are no peaks and troughs of heat as wood does when burning away, meaning you can be more relaxed about the sitting distance from the fire. Burning gas can offer a more consistent heating experience as the heat output will be the same, all evening. Similarly, the nuisance factor of smoke bothering your neighbour is eliminated. There are also liquid bioethanol-burning units that are small and transportable, offering a soft ambient glow, but a smaller degree of heat than gas. These can be quite ornamental too and there is an ever-increasing range available, including smaller, tabletop versions. They’re a good choice for those who rent or have decked areas and want something to act as a focal point for social gatherings. A woodburning cooking fireplace can be purchased from £1666 + VAT. Tabletop bioethanol burners start from as little as £200. A rendered masonry-based gas fireplace will come in at approximately £4000, dependent on the size and level of detailing. To clad or construct in stone will add some additional cost, but the sky’s the limit in terms of what contemporary materials might be used to create a stunning feature. As always, why not visit our website for up-to-date design ideas and installation downloads. While the origins of the modern day fireplace may date back to the 11th century, it has only been in recent years that the UK fireplace industry has ushered in a wide array of groundbreaking innovations that make the addition or renovation of a modern fireplace quite simple. Contemporary, efficient, balanced flue, no-chimney gas fireplaces in many formats are proof of that – and can now be controlled by smartphone app or home automation. If you or your client wants to install the real thing in a home, the shapes, sizes and styles are all seemingly limitless. One of the styles that interior designers are currently inspired by are the extra wide, linear fireplaces. Many can be installed just about anywhere in the home, for example using a balanced flue system or even a fanned powerflue, the flue route could be as long as 30 metres horizontally, or could even go downwards below floor level, to create a fireplace island. This image, below, is of a powerflue, see-through, 2.4 metre wide linear gas fireplace located between two rooms, in the process of installation. But hearth-related innovations have not just been limited to home interiors, outdoor fireplaces – or fire pits – using masonry or pre-engineered products ranging in design from simple but architecturally beautiful firebowls to super-minimalist polished concrete or engineered stone firetables that you can eat from are gaining ground, even in our climate. The gas-fueled fire pit has been given a new stage with its integration into the design of patio furniture and other outdoor architectural features. Today’s fireplaces more than cater to the specific needs and wants of the homeowner. We refer to contemporary, see-through fireplaces that can warm multiple rooms or prefabricated gas fireplaces that mount directly to the wall – and electric fireplaces that look both realistic and can really put out the heat. They are clean and minimal – and when chosen correctly they can complement the architecture of the living space. This, of course, is key to all fireplaces as they quickly become the focal point of any room. It is particularly important, though, because TVs are getting larger – and longer fireplaces balance and compliment these sometimes oversized televisions, so the TV doesn’t look too overbearing. As a result, a recessed television that hangs above the fireplace can appear perfectly balanced with the rest of the room – not taking any focus away from the design elements around it. Aside from the aesthetic factors, though, today’s linear fireplaces are also convenient as they can be installed to operate on electricity, gas or even bioethanol liquid fuel and can always be always controlled remotely. Ready for the TV to be installed! A decade ago, generally only the wealthy would have considered having more than one fireplace in the house, but now that there are a wide variety of new products on the market today that can fit most budgets and styles we find that in larger renovations or new-build, there are typically two or three indoor fireplaces and at least one outdoor firepit. 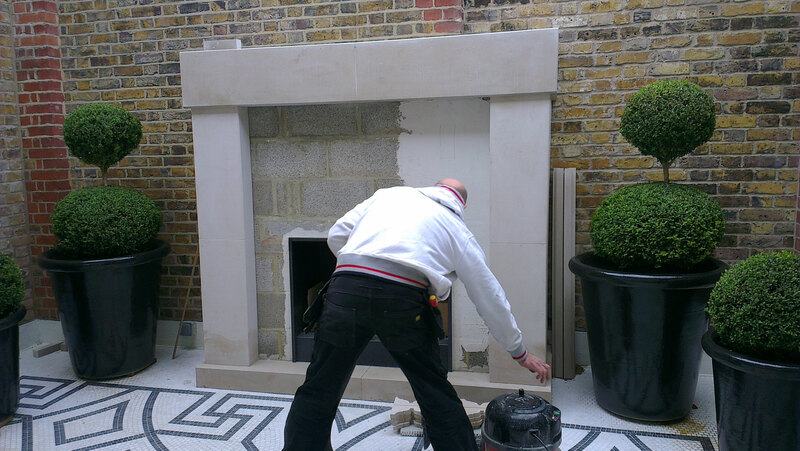 Today’s gas and electric fireplaces are installed for aesthetics and mood as well as for heating purposes. Architects have embraced our long, sleek horizontal fireplaces and are incorporating them into their contemporary designs. Equally exciting, when you consider the visual impact and benefit of a two- or three-sided fireplace or room dividers, the extra expense associated with it seems relatively low but offer designers unlimited creativity. 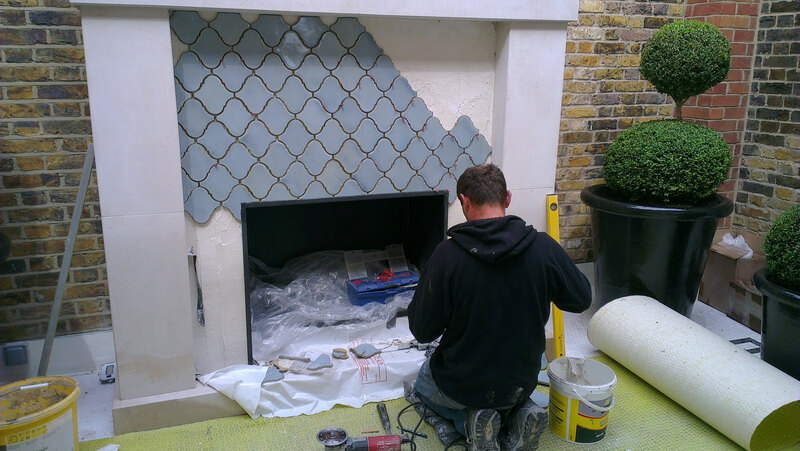 Second and third fireplaces are being installed in existing homes – sometimes for the calming effect they evoke. Specifically, gas and electric fireplaces that can be mounted directly to the wall, which in some cases do not require a flue are popular. Because of this, fireplaces are making appearances in kitchens, bathrooms and other private rooms of the house. Even wood burning fireplaces have updated style, including large glass windows that heat more efficiently and make for a handsome fuel-bed presentation. Similarly, woodstoves have been redesigned for greater efficiency, cleaner burning and are available in a wide array of styles ranging from traditional to ultra-contemporary. Our website includes a Gallery of images, depicting these and many other innovations including advice on balanced flues. 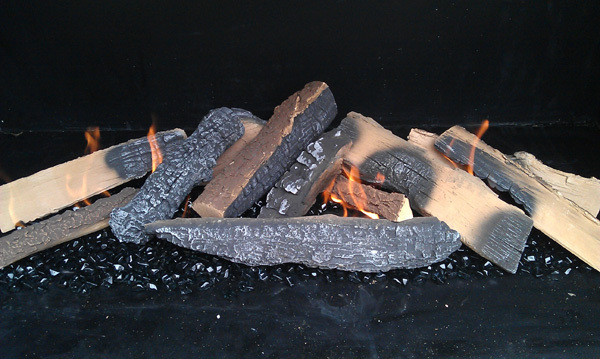 You may have been thinking about adding a fire feature to your garden or landscaping project. Outside gas and woodburning fires have become very popular in the UK & Europe, but as this acceptance has increased, so has a demand for different styles to evolve. We started by importing the Escea EF5000 outside gas fireplace and subsequenlty launched custom-built ‘frameless’ versions to satisfy the minimalist requirement of many designers and home owners. Urban Fires then introduced locally-made firetables and firepits to the UK & Ireland market last year. 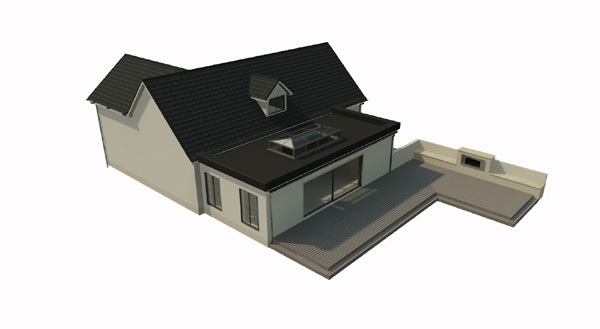 These bespoke models can be made to virtually any shape or size and from almost any noncombustible material, such as granite, engineered stone or rendered blockwork. We partner with designers and landscapers to create a different mood for every project. Now, we have introduced a range of firebowls that, although not bespokeable, there are sufficient options in the range to make every garden a little bit different. First, we offer two sizes, 850 diameter and 1090 diameter. Then, our gas burners can operate on either mains gas (NG) or LPG (propane cylinders). Optionally, the 850 model can also be supplied with a bioethanol burner, if no gas connection is available. There is also a wide choice of feature ‘fuel’. As standard, both models are supplied with Volcanic Rock as the gas media (see above). Different ‘fuel’ can be specified to sit on top of the Volcanic Lava – Crystalight, Pebbles, or even High Definition ceramic logs. Installation is simple, all that is needed is a gas supply as ventilation, drainage and piezo ignition are built in. The 1090 model even comes complete with a weather cover (optional on the 850). Our own technicians are trained to commission & certify these great products, or onsite personnel should be able to easily connect and commission. Finally, the standard finish can even be re-coloured in different shades by using exterior house paint. Many of our clients love the idea of a firepit. These great-looking features really do add value to your outside entertainment area. A square, rectangular or even circular firepit is really nice to sit around, warming you and your friends far into the night. A firepit can be powered by gas – either propane or piped natural gas – or even convenient bioethanol fuel, which is easily stored and the burner topped up before each use. Compared to burning wood, gas or bioethanol firepits are quickly becoming one of the most common options for outdoor fire pits. They are more environmentally friendly since they don’t release smoke into the atmosphere as is the case with traditional wood burning fire pits. Not only is this beneficial to overall air quality, but it can also make the outdoor experience more enjoyable. Gone is the unpleasantness of having smoke directly in your face when the wind suddenly shifts over your outside fireplace. Gas firepits are also easier to operate. Simply touch the control pad to ignite the gas and start enjoying your personal outdoor heater. But, have you thought about a firetable as an alternative? A firetable offers the same great look of real flames and runs on either gas or bioethanol fuel, but also delivers the very real convenience of a table in your garden – so useful for parking your wine glass, beer bottle or plate of food, whilst chatting to your guests! And you can do-it-yourself. 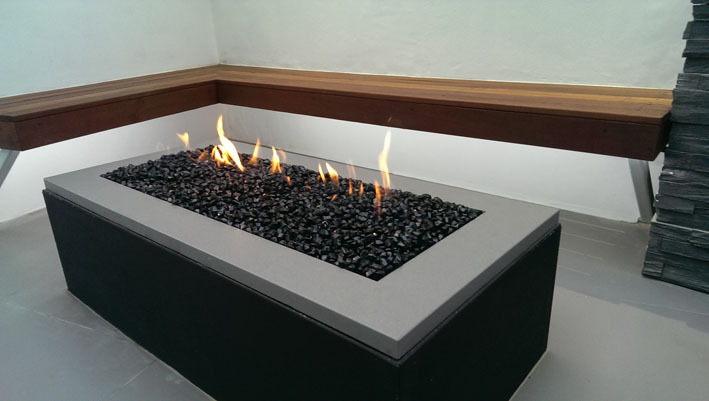 If you or your local builder can build the masonry, we can supply the technology to create your very own gas or bioethanol firetable. 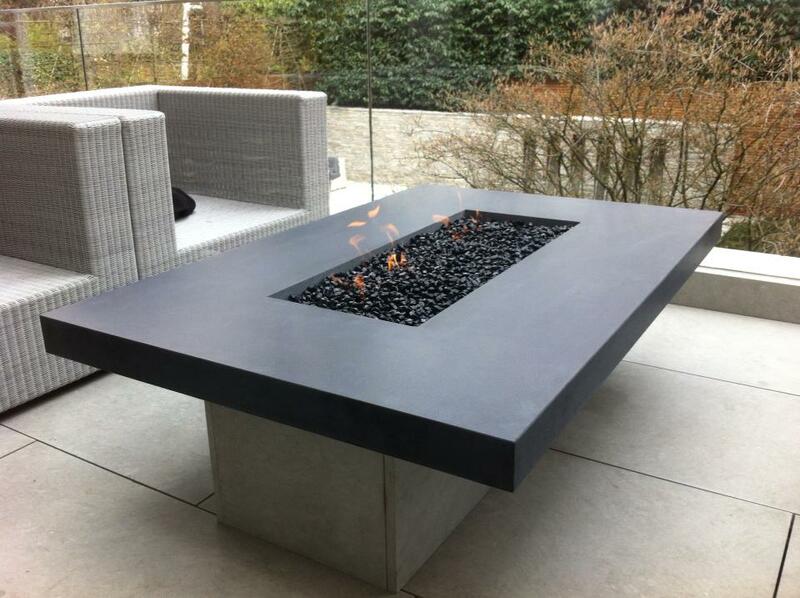 Our own firetables are made to measure from durable engineered stone in a range of finishes and colours. The stone tabletops are fabricated to a size to suit your garden furniture layout – and we make them to look as though they are 80mm thick! 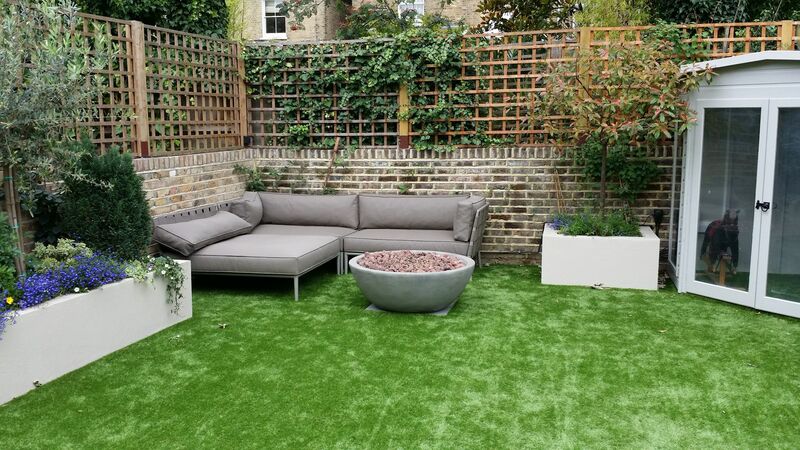 The base can be simply made from lightweight concrete masonry blocks which are then rendered to provide a nice finish in the colour of your choice, or it can be clad in matching or contrasting stone – or even decking materials. The weatherproof EF5000 gas burners can be finished off with Crystalight in a choice of four colours (see Black, above) or click here for the full range of options. The Crystalight can also be topped off with ceramic pebbles, if required. Control and electronic ignition is by a weatherproof touchpad which can be mounted in a concealed position. So, firepit or firetable? The choice is yours. There is a huge range of possibilities based around the materials that you choose. Then there is the contemporary look, or something more rustic. Has that got you thinking? What would you do for your garden? Most people would be delighted to live in a charming old boat-house by the Thames, but not Lysette and Nigel Offley. They decided to knock the whole thing down and start again – with a new house that took inspiration from the river with waves and curves – and a huge glass porthole of a roof-light. Their plan to build a dramatic new cutting-edge home by the River Thames proved difficult, costly and not very popular with their neighbours. And just a few weeks into their project, the problems begin. They couldn’t find a contractor willing to tackle the difficulties of building over water; their architect unexpectedly left and the costs came in much higher than anticipated. Not only that, but they then decided on a minimalist garden to match the dream home they were building. With no previous experience. And of course, along came Kevin McCloud and the CH4 Grand Designs team to film the whole thing! To assist the couple, Student of the Year (2011/12) of the Oxford College of Garden Design, Ana Mari Bull, produced the fabulous garden design already seen by viewers. To complement this design, we made a frameless firebox and combined it with our EF5000 weatherproof gas burners and touch-sensitive controls. Building our gas fireplace into a masonry enclosure integral to various other feature structures within the long, but narrow, garden created a natural focal point for entertaining or just chilling with a glass of wine. ​First broadcast in October 2012, the garden wasn’t actually finished in time for the show, but it is now in absolutely pristine condition, as you can see by viewing the images on this page or the larger gallery on our website. Full details of the different types of outside fireplace that are available can be viewed here. We believe that Kevin will be going back to see the finished article some time this year. So, hopefully, we’ll see you soon on Channel 4! 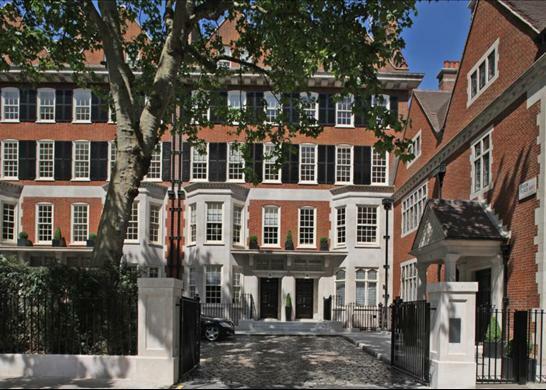 When we were asked to create an appropriate fireplace setting for a rooftop courtyard located in the heart of London, we wanted to complement the outstanding architecture of this significant listed building. views all around the city – and it was about to become a great place to sit, talk, relax and drink a glass of wine. 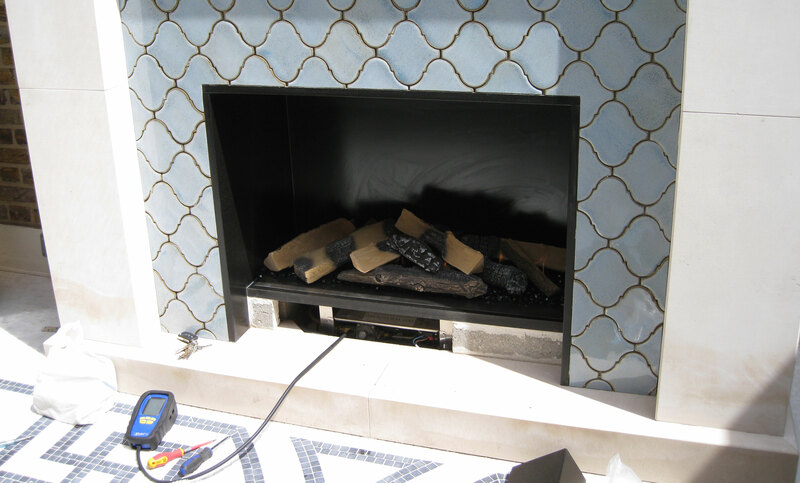 Our solution was a bespoke gas fireplace interior, using Escea EF5000 waterproof burners and concealed controls to sit within an architect inspired black granite fire opening in a classic mantel with tiled detailing. As the Escea burners do not need any flueing, the fireplace construction was quite simple, using standard building techniques for the internal masonry and a bespoke limestone mantelpiece. The on-site builders also used real craftsmanship when creating the stunning mosaic floor. The firebox was constructed from Absolute black granite and incorporates a raised granite hearth which conceals the gas connections and electronic controls. The twin burners are mounted in a bespoke stainless steel support tray. Our EF5000 burners are operated by a combined ignition and High/Medium/Low waterproof touch-pad membrane control switch, which in this case is mounted in a purpose-made stainless steel escutcheon plate rebated into the masonry. Following connection to the gas and 240v supplies, the burners were tested for gas soundness (below, right), correct operating pressure and the correct operation of the remotely-mounted electronic controls. A specialist craftsman added tasteful pale blue ceramics – almost the final touch (below). These ceramics complemented the mosaic flooring and – suddenly- this bare courtyard came alive! But the real finishing touch was in fact the use of our latest High Definition ceramic log set, placed on a selection of black Crystalight moulded ceramic glass pieces and creating a contemporary vibe by avoiding the rather tired ‘gas log’ cliche. The burnt log effect becomes increasingly realistic in the evening light, when the lambent flames become more prominent. Landscapers added some planting in the space and – surrounded by walls and windows as it is – the courtyard can now be used throughout the year, with the fireplace offering warmth on a chilly Spring evening or in the depths of winter, as well as a very welcoming aesthetic at any time of year. 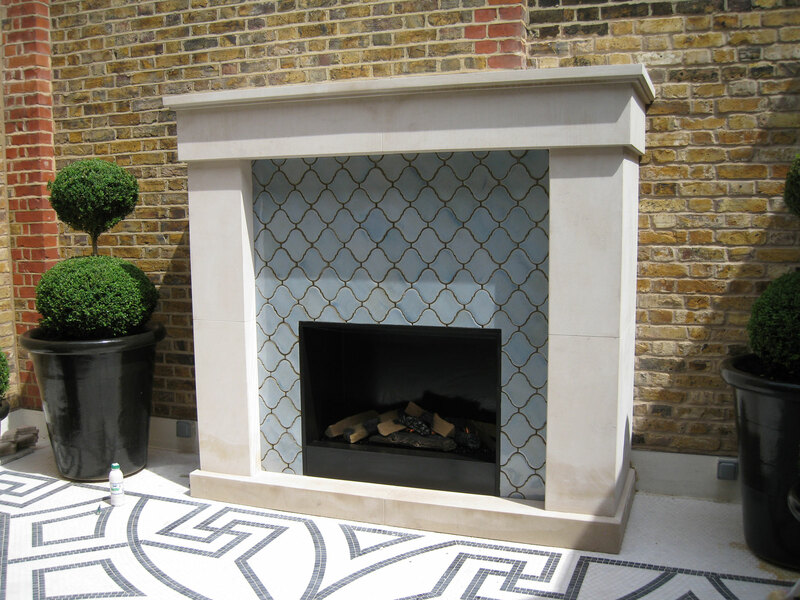 And this is the finished product – a stunning outside fireplace for a stunning building! 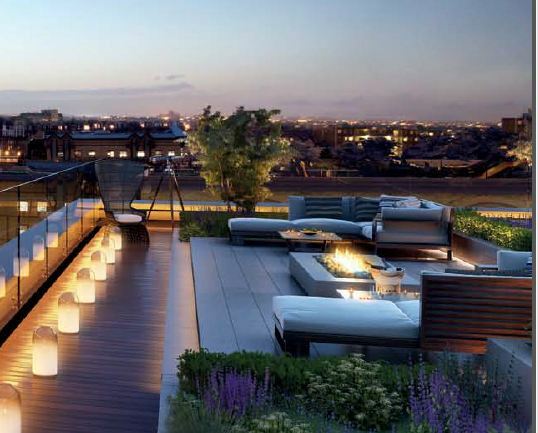 Combining the vision and skills of the project architects, interior designers and landscapers with Urban Fires’ experience and expertise has produced a unique outdoor space in the heart of the city. One that can be used virtually all-year ’round and one which will surely provide the owner with many years of pleasure. Cheers! Want an outside fireplace to warm a patio or deck on those chilly evenings – or to extend the use of an outdoor entertaining space into winter – but unsure how to start the design, or where to place it? 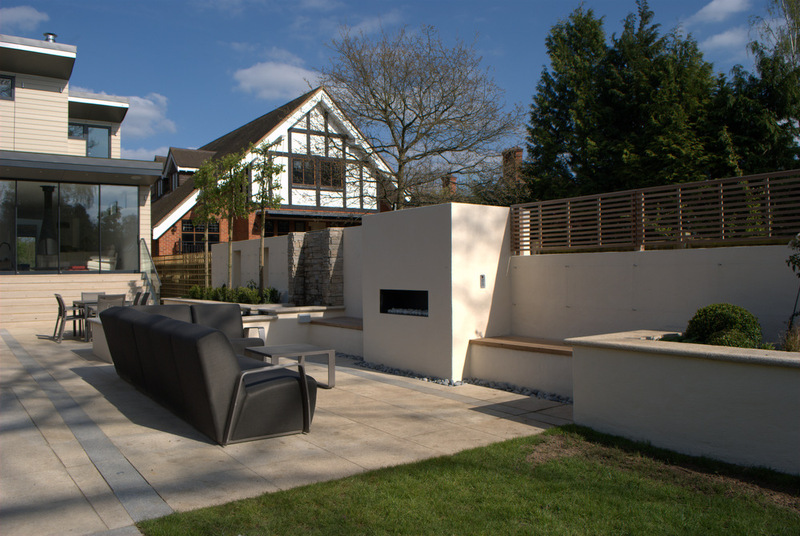 Whatever the style of the outdoor space, our range outdoor gas fireplaces will make a great focal point, with wide aspect openings and high heat output – these units are in a class of their own. We have two, very different, design options, the first is our standard-size EF5000 stainless steel gas fireplace. The EF5000 comes in a choice of colours with the option of adding stone or marble inserts into the facia. It will be necessary to build a suitable enclosure to house this fireplace, such as the one shown below or choose from our gallery. These 850mm wide burners may be used singly for fireplace openings up to 1.2m wide, or doubled up (or even trebled) for much wider openings. The choice is yours. We will bespoke a suitable burner-mounting tray to suit your design, or even a complete firebox using our patented render-up edge, which allows a perfect finish to your fireplace design. You can view these burners & controls and download CAD drawings here. Our waterproof burners will operate on either natural gas (piped mains gas) or LPG (propane cylinders). To replicate burning fuel, we can supply logs, pebbles, our stunning Crystalight jewelled fuel bed – or even a purpose-made sculpture for the adventurous! 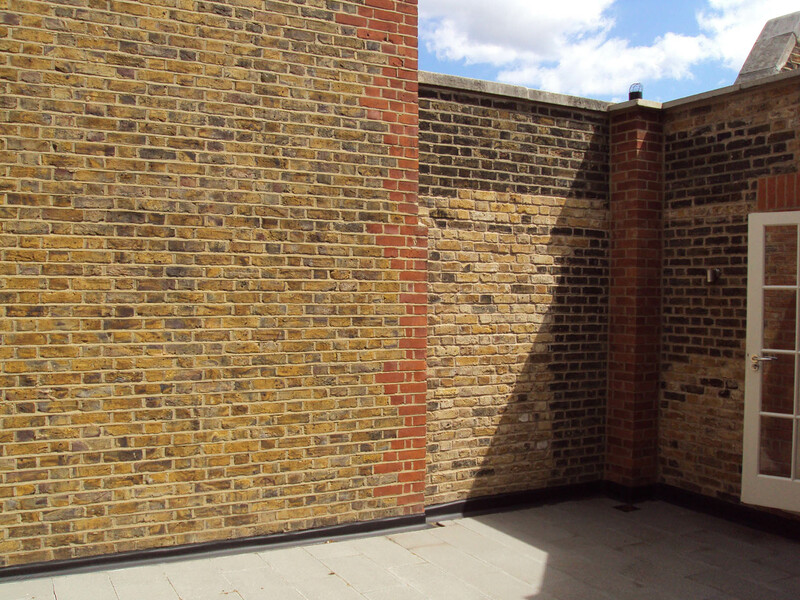 If a completely bespoke setting is required within an extensive garden remodelling exercise, or perhaps as part of a home extension project, the enclosure can be completely integrated into your chosen masonry or decking layout (below). The EF5000 heat engine is ‘zero-clearance’ – which means it can be installed right up against combustibles in your enclosure construction – like 2″ x 2″ timbers – without difficulty. However, one could also use lightweight building blocks. As a further simple installation option, a free-standing enclosure can be created using our ready-made Kitset enclosure frame (below). 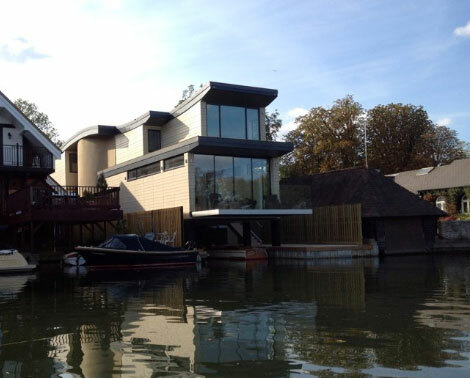 Just clad it in marine ply and render it – or face it with contemporary limestone panels, ceramic tiles, or any other suitable material or finish of your choice – even decking. Think about placing the fireplace near to the seating or eating area – but not too close as this unit can produce up to 15 kW/hr of real heat! No need to worry about flueing either, the EF5ooo doesn’t need a flue at all – not even an exhaust exit above the fireplace – and nor do our waterproof burners. Just supply either Natural Gas (mains gas) or Bottled Gas (LPG Propane) and a set of D-cell batteries to power the ignition (or use the optional 240v mains transformer kit). 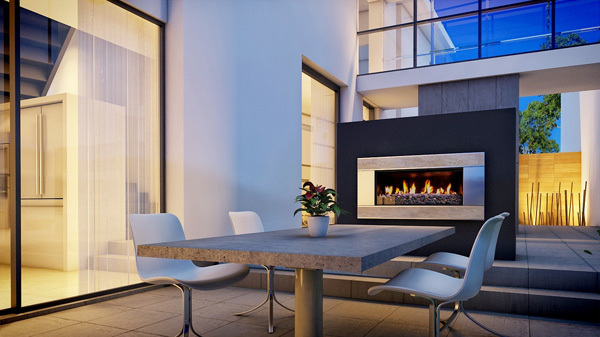 The EF5000 outdoor fireplace comes with options of three facia finishes and two styles, plus a choice of four different fuel beds, to customise any project. Both the EF5000 and our waterproof burners can be ignited by way of touch pad electronic controls which give the option of three different heat settings. 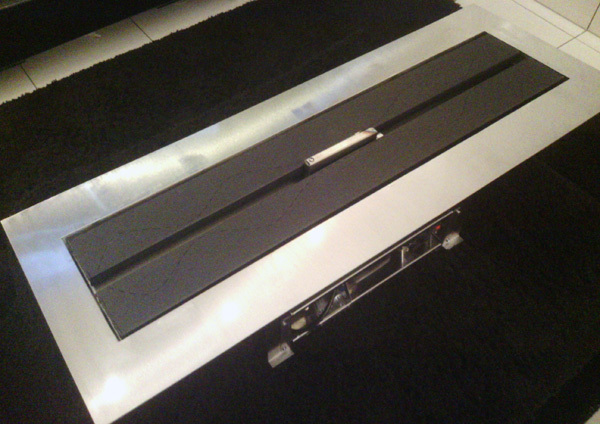 The touch pad can be mounted up to 1.5m from the burner in a suitable position. Optionally, a remote handset can be paired with the burner controls. EF5000 is made of 100% marine-grade stainless steel which needs only cleaning and an occasional hose down – yes, even the electronics are water-resistant! Visit the Urban Fires website for more information or to find a local reseller. Want a wood-burning version? Check out our EW5000 outside fireplace which can be supplied in either a contemporary or traditional look – and it doubles as a BBQ!